Janet Kaplan's full-length poetry books are Ecotones (forthcoming in 2019 from Eyewear Ltd.), Dreamlife of a Philanthropist (winner of the 2011 Sandeen Prize in Poetry from University of Notre Dame Press), The Glazier’s Country (winner of the 2003 Poets Out Loud Prize from Fordham University Press), and The Groundnote (Alice James Books, 1998). Her honors include grants from the New York Foundation for the Arts and the Bronx Council on the Arts, fellowships and residencies from Yaddo, the Virginia Center for the Creative Arts, the Ucross Foundation and the Vermont Studio Center. Her work has appeared or is forthcoming in Arts & Letters, Barrow Street, Cross Currents, Denver Quarterly, Exposition Review, Interim, Pool, Sentence, The Paris Review, The Southampton Review, Tupelo Quarterly, and many others, as well as in the anthologies An Introduction to the Prose Poem (Firewheel Editions, 2007), Lit from Inside: 40 Years of Poetry from Alice James (Alice James Books, 2012), and Like Light: 25 Years of Poetry & Prose by Bright Hill Poets & Writers (Bright Hill Press, 2017). 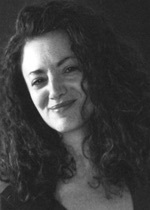 She has served as Poet-in-Residence at Fordham University and is currently a member of the creative writing faculty at Hofstra University, where she edits the digital literary magazine AMP (amp.hofstradrc.org).